On the one hand, we can’t get enough of them – stringing stars, ratings and user reviews around restaurants like fairy lights. It’s ritzy, exciting, and taste makes for great debates. On the other, in our heart of hearts, we all know that judging one completely different set of dishes, rooms, chefs and customers above another is inherently ridiculous. Now, I’ve no idea what awards mean to Sunil Ghai of Ananda, Jaipur’s flagship Indian restaurant in Dublin. But he’s just been voted Best Chef in Ireland – beating off colleagues like Paul Flynn and Nevin Maguire to bag top honours at the 2013 Irish Restaurant Awards. Readers will have their own views on the result (and it’s hard to see how any shortlist could omit Mickael Viljanen, Kevin Thornton or Martijn Kajuiter, to name but three). But that said, I can’t think of anyone who would begrudge Ghai this little addition to his mantelpiece. Ananda is a class act. To step into this sanctuary in the Dundrum Town Centre is to enter a world that feels indulgent without being intimidating, an opulent space brought alive by warm and well-versed service. Indian restaurants in Ireland can be heavy on drapes and low on daylight, but Ananda is a whole other prospect. It feels like the lovechild of a luxe cocktail lounge. 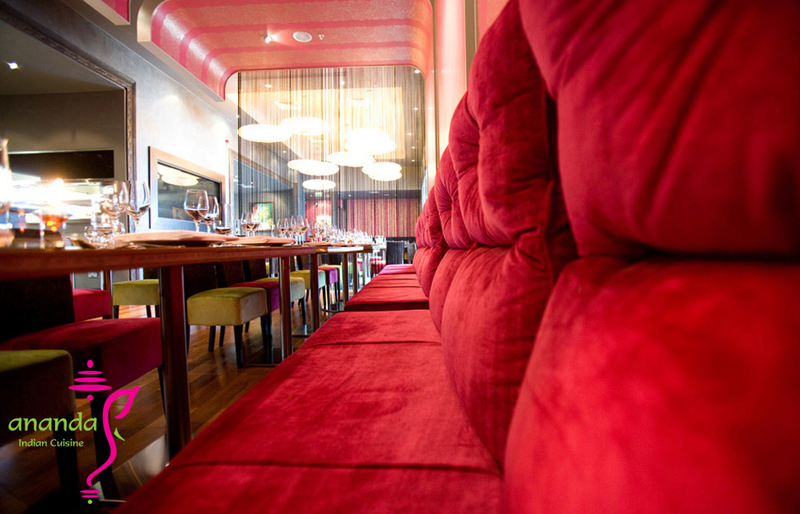 There are velvet seats, splashed with palates of aubergine and lime. There are tasselled dividing curtains, lights that look like ocean creatures, slate-grey wallpapers and a smoky picture window peering into the kitchen. But there are also big windows, high-chairs for kids, and genial staff. Ok, the first main course on the menu is a chicken tikka masala. But push beyond that, and a fascinating fusion of Irish ingredients, Indian dishes and contemporary cooking emerges. Ananda means ‘absolute joy’, and that’s exactly what I feel flicking through dishes like pan-fried Howth lobster in a Goan-style sauce with tamarind rice, or Waterford monkfish tail cooked in the Tandoor with roasted vine tomatoes… accompanied by kofta with turmeric and rock salt. It’s exciting stuff – and that’s not even getting started on the cornucopia of sides, naan breads, chutneys, poppadums and amuse bouches (in our case, a bite-sized potato and spinach patty topped with a dot of yoghurt and a sprightly leaf). Ananda can be expensive, but it’s also one of those places where you feel like your money ends up on the plate, and in the service. One of our starters, for example – jumbo prawns with spiced Jaipuri salt, lemon and chilli – costs a forbidding €15. Obscene as it sounds, they’re worth it. Five enormous prawns come butterflied and blow-torched, offering succulent, tangy and authentic mouthfuls alongside a brilliant little salad, which marries melon, basil and cumin seeds into a sweet and perky side. Pan-seared Kilkee scallops are also pricey, but the presentation is divine. Three scallops are laid on beds of celeriac cream, topped with pristine veils of coconut froth, and served with a fruity kumquat chutney and a broccoli puree so green it would make Willy Wonka giggle. My main is a rack of Wicklow lamb rack, slow-cooked over charcoal on a Robata grill. The chops are finger-lickin’ good, there’s a comforting bed of chickpea and chard, a pomegranate emulsion, and a couple of medallions of sweet potato with a delicious almond and mint pesto. It’s a dish that looks pretty, fills the belly, and showcases the astonishing range of Indian cuisine… all at once. Ananda also offers a selection traditional dishes, and from these we order Thali (essentially an Indian tasting plate), which combines small portions of Rogan josh, a Goan prawn curry, spiced potatoes and saag chicken with rice and bread. It costs €30, but goes down a treat. Ananda carries a lengthy and surprising wine list, and goes to great length in accommodating coeliac diets, though L is disappointed to find no gluten-free chocolate option amongst the desserts. We share a raspberry sorbet – a good fresh finish – but it’s not what she would have wished. Is Ghai the best chef in Ireland? Who knows. And who cares. As long as he continues with this unique alchemy of Irish ingredients and Indian cuisine, everyone’s a winner. Dinner for two with three glasses of wine came to €117.50, tip extra. Dundrum Town Centre, Dublin; 01 296-0099; anandarestaurant.ie.